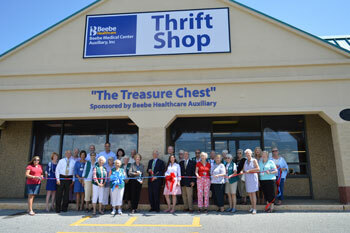 The Beebe Auxiliary "Treasure Chest" Thrift Shop hosted a ribbon cutting last week with the Lewes Chamber of Commerce and the Rehoboth Beach-Dewey Beach Chamber of Commerce at its new location. The store features expanded space for furniture, art, and home goods! The new location is just a few doors down from the old location in the shops at Midway (behind La Tonalteca and next to the Midway Speedway go-kart track). Nancy Tartaglione, President of the Beebe Auxiliary, said she is proud of the success of the Thrift Shop, which gives more than $300,000 annually to Beebe Healthcare. This year's gift of $311,000 is helping fund a new program in Cardiac Electrophysiology. The Thrift Shop opened in 2007 with about 2,850 square feet of space. The new store features more than 7,900 square feet! Beebe Healthcare thanks the Beebe Auxiliary and its volunteers, who contribute more than 34,000 hours of volunteer service each year. Congratulations on all your hard work and dedication to Beebe Healthcare! The Auxiliary's Treasure Chest Grand Re-Opening celebration will be held Tuesday, August 30 and Wednesday, August 31, when everything in the shop will be discounted. Beebe Healthcare President and CEO Jeffrey Fried cuts the ribbon to celebrate the grand reopening of the Beebe Treasure Chest Thrift Shop. He is joined by (l-r) Patty Burkentine, Rehoboth Beach-Dewey Beach Chamber of Commerce; Betsy Reamer, executive director of the Lewes Chamber of Commerce; C. Wendell Alfred, past president of Beebe Auxiliary; Rosey Vanderhoogt, Beebe Auxiliary Recording Secretary; Bonnie Cunningham, Beebe Wound Healing & Hyperbaric Medicine; Ken Carson, Beebe Wound Healing & Hyperbaric Medicine; Kathi Gelwicks, volunteer; Peggy Weaver, volunteer; Sen. Ernie Lopez, R-Lewes; Andreé Catalfamo, volunteer; Mary DeVries, volunteer; Lynn Wilkins, Beebe Healthcare 100th Anniversary History Committee Co-Chair and Executive Assistant, Office of the President; Martha Tutak, volunteer; Dennis Reardon, Lewes city councilman; Nancy Tartaglione, Beebe Auxiliary president; Jeffrey M. Fried, president and CEO, Beebe Healthcare; Tommy Cooper, chair of Beebe Medical Foundation; Amanda Deschenes, thrift shop manager; Myrna Kelley, Beebe Auxiliary member; David A. Herbert, Vice Chairman, Beebe Board of Directors; Ruth Patterson, volunteer; Pat Sandy, treasurer, Beebe Auxiliary; Aileen Macturk, volunteer; Lesley Nance, Beebe Auxiliary First Vice President; Doris Bender, volunteer; Ginger Stevenson, volunteer; Sara Spencer, Beebe Auxiliary member; Janet B. McCarty, Beebe Board of Directors and 100th Anniversary Steering Committee Co-Chair; LaVonne Wontorek, volunteer; Nancy Almacy, Beebe Auxiliary, Second Vice President; and Becky Carney, Lewes Chamber of Commerce.